If you are looking for something new to do with the little ones, the Ft. Collins Museum of Discovery is full of unique, hands-on fun! While you are in town, check out local favorite Big Al’s Burgers and Dogs, then take a stroll around the corner to Mary’s Mountain Cookies to pick up a treat before heading back South. The Ft. Collins Museum of Discovery inspires kids to explore Science, Technology, Engineering & Mathematics with hands-on exhibits and activities. There is something for every child to enjoy, from The Tot Spot to the Music and Sound Lab to Wildlands and Wildlife. Below are just a few of the highlights from this adventurous museum. 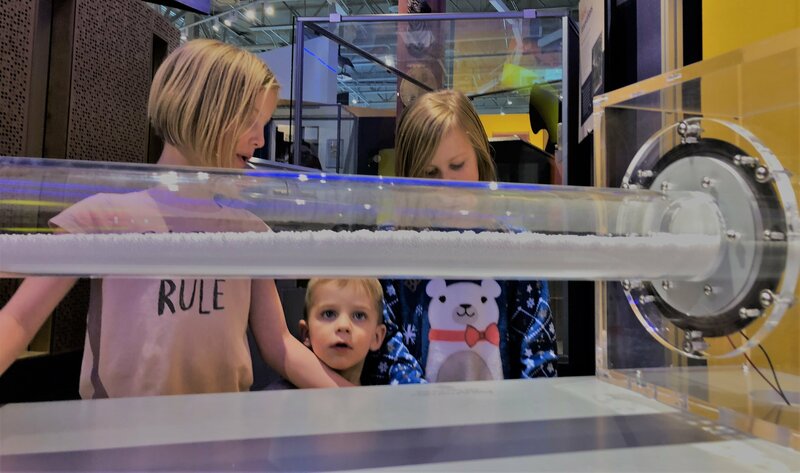 This exhibit encourages kids to turn scientific concepts into action with some fun, hands-on activities that explore motion, light, color and more! Your little one is going to revel in this amazing toddler-centered exhibit. They will love the giant, interactive train table, sink or float water zone, art center and life sized crawl-through tree. Is there anything more fun for a kid than making noise? This exhibit allows kids to try out a variety of fun (and sometimes loud!) instruments, including a full drum set, guitars, horns and so much more. This exhibit allows kids to explore the creatures and lands that existed in Ft. Collins millions of years ago! Prehistoric beasts and flora are accompanied by a complimentary exhibit showing the plants and animals that inhabit Ft. Collins today. My kids’ favorite part was hopping into the tornado chamber. A real-life vortex, the chamber is hair-flying fun! There is so much more to this fantastic museum, including live animals, innovations lab, Ft. Collins history, natural areas, and even a dome theater. The museum is about an hour’s drive from Boulder, but well worth the trip! Just a few minutes away from the museum in beautiful downtown Ft. Collins, Big Al’s Burgers and Dogs is the perfect spot to take hungry kids after a fun morning at the museum. The menu is full of amazing food that is both kid-friendly and satisfying for adults (vegetarian options available), and easy on the pocketbook! Be sure to try the fries, choose from classic, sour cream & onion, buffalo wings flavored, vinegar or truffle fries. Kids can play with restaurant-provided Mr. Potato Heads while waiting for food to arrive. Fun all around! Big Al’s Burgers and Dogs is located at 140 W Mountain Ave, Fort Collins, CO 80524. For the full menu, click here. Just around the corner from Big Al’s, stop in at Mary’s Mountain Cookies for a quick treat before hitting the road back home. These are more than just cookies, they are decadent masterpieces. Kids will have a hard time deciding between M&Ms cookies, S’Mores cookies, or even a cup full of edible cookie dough. Indulge in a cookie yourself! Other varieties include salted caramel cookies, turtle cookies, and snickerdoodle. Coffee, of course, is also available to revive tired parents. Mary’s Mountain Cookies Downtown is located at 123 N College Ave #106, Fort Collins, CO 80524. For the full menu, click here.